A carjacking was reported in central Carrollton and armed robberies were reported in the Broadmoor and Milan neighborhoods over the past weekend, according to initial police reports. The carjacking was reported shortly after 6 p.m. Saturday in the 7900 block of Plum Street, where a woman was sitting in her car in the driveway, the report states. A man armed with a gun approached and demanded her purse, and when she got out of the car, the gunman jumped in and drove off, the report states. Later Saturday evening, around 9:30 p.m., a woman was opening the front door of her home in the 5000 block of South Tonti in Broadmoor when she was confronted by a stranger “armed with an unknown object,” the report states. He took her phone and purse, and ran off on Robert Street, the report states. 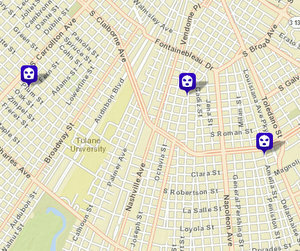 NOPD crime maps also show an armed robbery in the 2900 block of Amelia Street around 2 p.m. Friday, but a description of that incident was not included in the weekend’s initial reports. Around the same time Friday afternoon, the nonprofit ProjectNOLA crime-monitoring site reported that police were looking for a robbery suspect in the Milan Street area near the Wendy’s in the 4200 block of South Claiborne. No further details on the robberies were immediately available.